Orlando, Florida – October 18, 2018. General aviation and commercial transport aviation are different in many respects, yet they share a common goal: to improve the passenger experience. This has driven new innovations in aircraft cabin systems using Research Frontiers’ patented SPD-Smart electronically dimmable windows (EDWs) to improve how passengers feel while in flight. 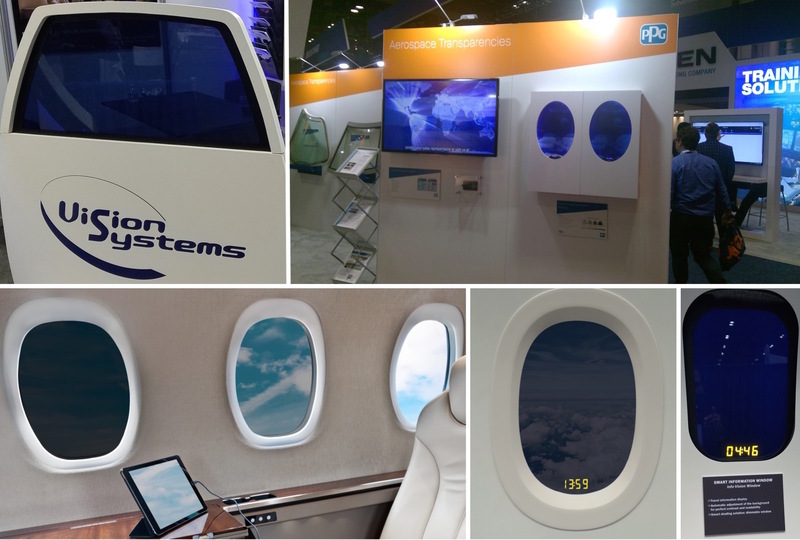 This week’s NBAA business aviation show is the stage for visitors to experience just how intelligent aircraft passenger window systems have become – visitors are interacting with a variety of SPD-Smart EDW products by Research Frontiers licensees Vision Systems and InspecTech Aero Service. These solutions are delivering unprecedented benefits to passengers on board all types of fixed wing and rotor aircraft. By using SPD-Smart EDWs, passengers and crews can “tune” the amount of light coming into the aircraft cabin, at the touch of a button – to preserve views, reduce unwanted glare, and manage the optimum amount of healthy daylight for passenger well-being. Cabin-wide control of the amount of light and glare entering the aircraft improves the flying experience for all, instantly transforming the cabin interior, and synergistically complementing other systems, such as mood lighting and in-flight entertainment systems. Aircraft windows are a primary path for heat, noise, glare and other environmental elements entering an aircraft through the window opening. These unwanted elements – cabin heat while the aircraft is at the gate or on the taxiway, and cabin noise during the entire flight – are well known to cause passengers discomfort, fatigue, jet lag and other ailments. SPD-Smart EDWs, with their multilayer configuration of films and interlayers, provide all passengers with a cooler, quieter, and more comfortable cabin. Vision Systems is presenting a diverse number of their second-generation SPD-Smart EDWs, branded Nuance V2. Nuance V2, with enhanced optics and a lower cost, responds to industry requests for systems that allow for brighter cabin interiors, while providing more effective shading. Multizone: This Nuance V2 solution allows independent control of light and glare through different “zones” of an SPD-Smart EDW, to any level of tint. Variable light control with diffused light / privacy control: This SPD-Smart solution enables instant and precise dimming from clear to very dark, plus an opaque white or dark feature for privacy and enjoying soft, diffused daylight through the EDW. Interactive: Vision System’s Info-Vision is the first smart information window integrating SPD-Smart and electroluminescent technologies. This economical innovation, for use in windows and cabin dividers, provides passengers with travel and other information right on the window. The tint of the Info-Vision EDW can automatically adjust in real-time, providing optimal contrast and readability. Cabin Divider: The Nuance V2 cabin divider enables adjustable levels of privacy between classes, and allow flight attendants the ability to view multiple cabins whenever needed. SPD-Smart products from Vision Systems and PPG Aerospace: Electronically Dimmable Windows (EDWs), dimmable cabin divider, and interactive information window integrating electroluminescent technology. Aircraft windows and interior designs using Research Frontiers’ patented SPD-Smart light-control technology can be seen at the Vision Systems booth (#1964), PPG Aerospace booth (#3005), Lufthansa Technik’s booth (#3435), and on aircraft manufactured by Textron, HondaJet, Eclipse, Epic, Eurocopter, Bell Helicopter and others. Note: From time to time Research Frontiers may issue forward-looking statements which involve risks and uncertainties. This press release contains forward-looking statements. Actual results could differ and are not guaranteed. Any forward-looking statements should be considered accordingly. “SPD-Smart and “SPD-SmartGlass” are trademark of Research Frontiers Inc. “Nuance,” “Nuance V2,” “Nuance V2 Multizone,” and “Info-Vision” are trademarks of Vision Systems.